Some federal and state prisoners could soon be eligible for federal student aid to take college courses while behind bars. The aid would come in the form of Pell grants, which are for low-income people and do not have to be repaid. The Education Department confirmed Tuesday of this week that it would conduct a limited pilot program to give prisoners access to the Pell grants. 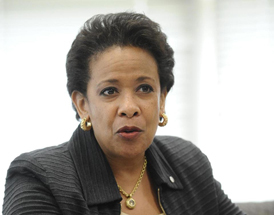 The official announcement was scheduled for Friday, when Education Secretary Arne Duncan and Attorney General Loretta Lynch visit the Maryland Correctional Institution in Jessup, Maryland. The prison has a partnership with nearby Goucher College. Previewing the program, Duncan said Monday that the administration wants to develop "experimental sites that will make Pell grants available" to inmates to help them get job training and secure a productive life after they are released. Asked for more details, Duncan told reporters in a call after the speech, "Stay tuned." Department spokeswoman Dorie Nolt declined to disclose any specifics on the length of the program, which prisoners would be eligible and how it would work. Congress passed legislation in 1994 banning government student aid to prisoners in federal or state institutions. By setting up the proposed "experimental sites," the administration would be seeking to get around the ban with a pilot program. The experimental sites section of the Higher Education Act of 1965 gives federal officials flexibility to test the effectiveness of temporary changes to the way federal student aid is distributed. The tests could give the Education Department data to support possible revisions to laws or regulations. More than 2 million students now receive Pell grants, according to Duncan. The maximum award for the 2015-2016 school year is $5,775. On Friday, Duncan and Lynch were scheduled visit Goucher College's Prison Education Partnership at the Jessup facility. More than 70 students are enrolled in Goucher College through the partnership, which began classes for prisoners in 2012 and does not receive public funding. The inmates don't pay tuition, and books and supplies are provided at no cost, according to the partnership. "Getting a college education takes an incredible amount of hard work," Amy Roza, director of the partnership, said in an interview. "The program helps with skills like critical thinking and problem solving." About 70 percent of students in the program are first-generation college students, Roza said. Education Department Undersecretary Ted Mitchell this week called Pell grants "one of the key levers that we have" to increase the college completion rate. Advocates for expanding federal student aid to prisoners point to societal benefits. A 2013 Rand study found that inmates who took part in education programs behind bars had 43 percent lower odds of returning to prison than inmates who had not. Supporters say the correctional education programs are cost-effective compared with the costs of re-incarceration. Reps. Donna Edwards, D-Md., and Danny Davis, D-Ill., introduced legislation in May that would reinstate Pell Grant eligibility for federal and state prisoners. At the time, Edwards said it would go a long way to helping curb the nation's high incarceration rate through education.